A monumental statue of the Roman emperor Trajan has been discovered in the ancient city of Laodicea near the modern city of Denizli in what is now western Turkey. The statue is three meters (9.8 feet) high and depicts the emperor dressed in full military regalia towering over a much smaller figure of a prisoner with his hands tied behind back. The quality of the sculpture is exceptional, with fine details carved on the emperor’s breastplate, face and clothing. It dates to 113 A.D.
Laodicea was in the province of Phrygia (the bound prisoner is wearing a Phrygian cap), located on an important trade route that brought it great wealth and prosperity. It was so rich, in fact, that when an earthquake destroyed the city in 60 A.D., the residents refused any aid from the empire and rebuilt it with their own funds. They rebuilt it in grand style, its most prominent citizens sponsoring the construction of theaters, baths, temples, a stadium and a myriad other public buildings and works of art. It was granted free city status under Roman making it autonomous and self-governing. It even minted its own coins. It was also highly seismic. The statue was found broken in 356 pieces, all of them clustered together. Archaeologists believe it was toppled and broken in an earthquake and was buried under a fountain. That’s why it survived almost entire in one place despite the extensive breakage. The sculpture was discovered in the same location as the Water Law, the incredibly long and detailed inscription describing the many and varied penalties for violations city water laws. 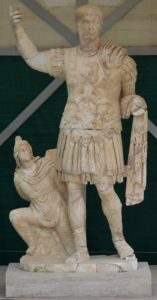 The statue depicts Trajan wearing a short chiton and has a cloth falling from his left shoulder, which, according to [lead excavator Professor Celal] Şimşek, is worthy of attention. “The images on the armor can be observed very clearly. On the upper part of the armor, there is the thunder of Jupiter, the celestial god of thunder. Medusa is located right in the middle of the chest, which is important because it shows the emperor’s frightening side. There are two reciprocal griffons [a legendary creature with the body, tail, and back legs of a lion], which are the symbol of the god Apollo. We see Apollo as the god that protected the fine arts. With this, what to comes to mind is that the emperor did protect fine arts at his time,” he said. “There is a water can in the middle. The griffons stretched their front legs towards the water bowl. Given the Water Law, it shows that he was an emperor who brought waterway to Laodicea with arches and pipes made of travertine. He gave 30,000 Denarius. I matched it with today’s money, and it is about 300,000 Turkish Liras. After that, because Laodicea was a very rich city, they built a great statue and put it at this fountain. Perhaps people from all over the world will come and see this work here. This statue is important in this aspect. 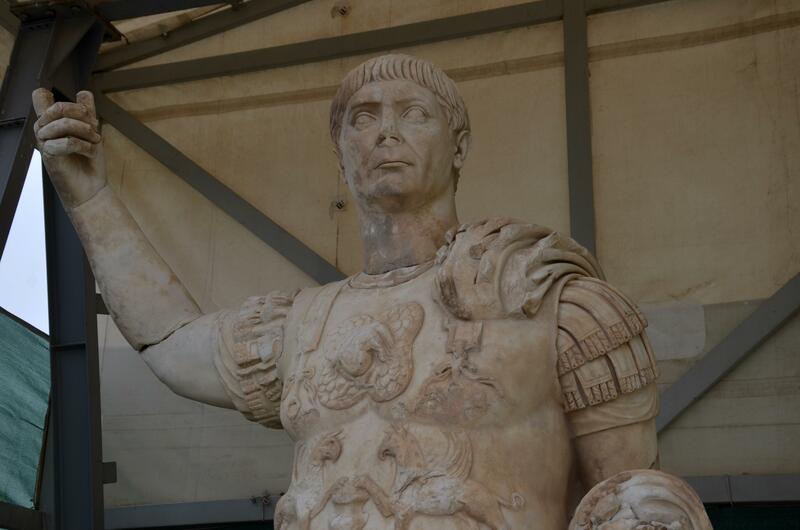 Indeed, in terms of both proportion and portrait, we are truly happy to find this statue of the emperor,” he added.